Mexican authorities describe the Central Americans as asylum seekers, but the Department of Homeland Security vowed that the ‘lawless caravan’ would not be allowed into the U.S.
MEXICO CITY — A caravan of about 1,600 Central American migrants camped Tuesday in the Mexican border city of Piedras Negras, just west of Eagle Pass, Texas. The governor of the northern state of Coahuila described the migrants as “asylum seekers,” suggesting all had express intentions of surrendering to U.S. authorities. While previous caravans had traveled to the border city of Tijuana, where migrants have to join a waiting list to make asylum claims, the relatively open border around Eagle Pass is different. The border is marked mainly by the Rio Grande and lacks the long sections of high barriers found in Tijuana. Still, the U.S. Department of Homeland Security vowed that the “lawless caravan” would not be allowed in. Images from local media showed U.S. agents with riot gear and shields standing on a bridge separating Eagle Pass and Piedras Negras. DHS said Border Patrol officers already had apprehended some migrants who crossed the border illegally overnight. Coahuila state Gov. Miguel Angel Riquelme said the Central American migrants arrived late Monday aboard 49 buses from the cities of Saltillo and Arteaga. Another smaller group headed toward the neighboring state of Nuevo Leon. An improvised shelter was set up for the migrants at an unused maquiladora factory, and local officials said the migrants had been given sleeping mats, blankets, food and wireless access. State child welfare officials reported that 46 unaccompanied youths aged between 15 and 17 were in the caravan. “That is why we are being strict about security,” Coahuila state Interior Secretary Jose Maria Fraustro said. Local media reported that some migrants objected to guards and closed gates at the improvised shelter, saying they did not want to be locked in. Participants in caravans of mainly Honduran migrants last year mostly went to the border city of Tijuana in their bid to reach the United States. But Tijuana officials said their city was overwhelmed and unprepared to receive more migrants, after a mass rush by migrants trying to cross the border led to temporary closure of some crossings. A second, larger caravan of several thousand migrants is expected to set out across Mexico soon. 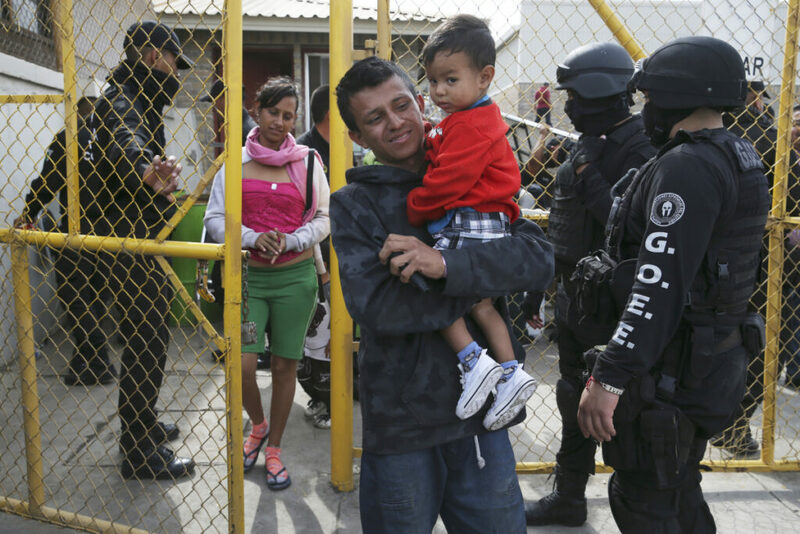 The U.N. refugee agency noted that Mexico had received 12,574 requests for humanitarian visas Jan. 17-29, almost all from migrants who left Honduras, Guatemala and El Salvador. The agency interviewed almost 1,000 of the migrants on the border bridge between Guatemala and Mexico. Of those interviewed, almost 30 percent said they wanted to reach the United States; 46 percent said they might remain in Mexico. Almost one-third were minors.